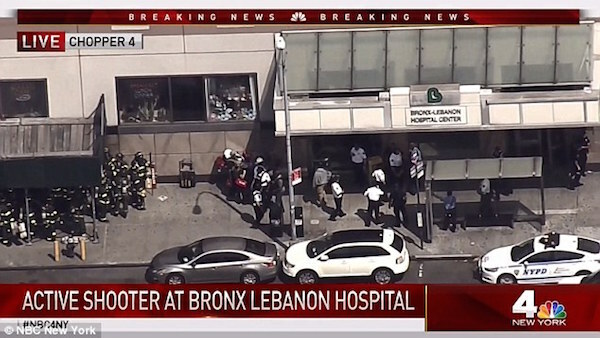 The New York City Police Department are investigating an active shooter at Bronx Lebanon Hospital amid reports that at least two people have been wounded. The incident began unfolding at around 2.45pm at the medical center on Grand Concourse in the Morris Heights section of The Bronx. Police sources say a gunman dressed in black opened fire on the 16th floor of the hospital and shot two people. ‘Active shooting in Bronx Leb. Two confirmed shot. Man dressed all in black. Smoke from the 16th floor,’ the NYPD Special Operations Division tweeted. Heavily armed NYPD units were dispatched to the scene and proceeded to scour the building in search of the suspect. The New York Daily News reported that a trail of blood was found leading from the second to the eighth floor. The gunman is believed to be barricated in the 16th floor.